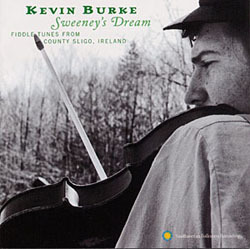 A fiddle player with an instantly recognizable sound,Kevin Burke is well-known today as a former member of the Bothy Band and a current member of Patrick Street and Open House. This was his first solo recording, made in 1972 during Burke's first visit to the US, and now reissued on CD. The album was a bit of an experiment, which grew out of his meeting American musicians in New York and discussing with them common traits of Irish and American folk music. The accompaniments on banjo, mandolin, guitar and autoharp are rather crude and somewhat obstrusive at times. Kevin's playing itself is quite a bit rougher than what we have become familiar with. Yet he already had that great lift and swing to his music, with at the same time a certain nonchalance which seems to reflect his personality. As Don Meade points out in the notes (all new sleeve notes by Don and Kevin himself), Kevin re-recorded many of the tunes here on later albums, and several of them have become associated with his playing ever since. An interesting, if not essential, album.